Last Saturday was my birthday and I couldn’t resist making some cupcakes. If you’re looking for a good yellow cake recipe, I highly recommend this one from Smitten Kitchen. It is truly the best birthday cake. 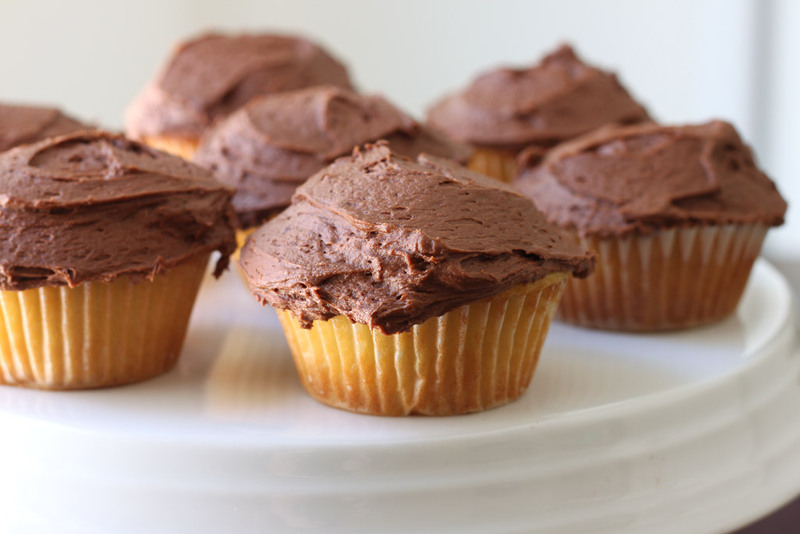 I’ve tried about a billion yellow cake recipes over the years and I’ve always found them to be bland and/or dry, but these cupcakes were perfect. The frosting was also the best homemade frosting I’ve ever had. I gave up on homemade frosting a long time ago because it was always such a pain to make (at least before I had my stand mixer) and would get dried out and inedible. But this fudge frosting is light, fluffy and very chocolatey just like the kind you buy at the grocery store and it didn’t dry out at all. I’ve been eating these cupcakes all week long and the last one was just as good as the first.